MEDCET means Medical Entrance Test. Doctor is a such a wonderful profession only that doctor can save number of lives where can be praised irrespective of caste, religion, poor and rich.Such doctors should face lots of struggle to get through the course of medicine. The first step to become doctor is that to qualify and secure good marks in entrance test to get seat in good medical college. We know that already EAMCET exam have been completed recently. where as MEDCET is going to be conducted very shortly. Where here a student can get admission with reasonable fee. 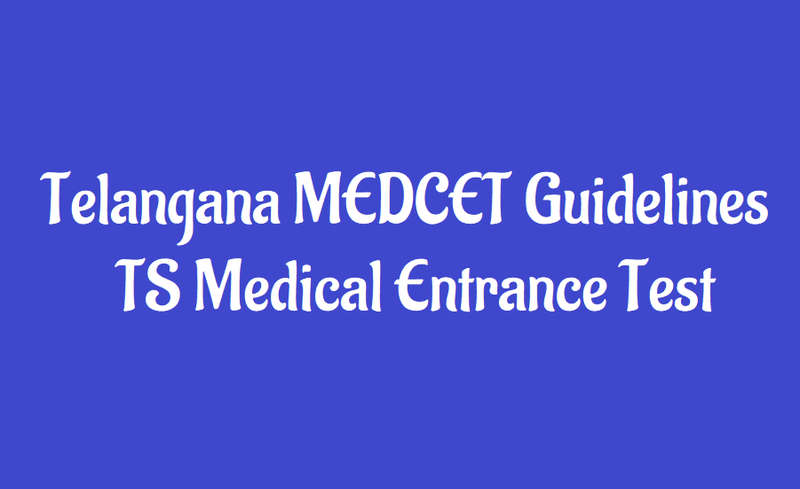 MEDCET 2019 for MBBS and BDS Admissions in Telangana State Private Medical and Dental Colleges. MBBS and BDS seats in private medical and dental colleges in Telangana state will be filled through a separate entrance test called MEDCET 2019 to be conducted in month of June 2019. The Telangana State Government has proposed the private medical and dental colleges to conduct separate entrance test for admission into B category seats in respective colleges. The admission will be completed under the supervision of Government, Health University and Private Colleges Association. For admission in MEDCET is that entrance test for private medical colleges (35% "B"category seats) for the study of medicine and dental courses. It is purely for private colleges.This MEDCET will be conducted in A.P.on May 30th 2019.Where as in Telangana may be on June 3 rd or 6th. The corresponding notification may be released with in a week by selected convenor by private colleges management. 1. All pvt colleges management will form as a committee to fill up 35% of medical and dental seats through MEDCET. 2. Among those one will be selected as a Convenor,Convenor will release the notification. 3. The responsibility of conducting exam will be given to independant institution. 4. Not only in main cities of Telangana but also in other main cities allover the country exam will be conducted. 5. AFRC Will supervise all above mentioned. 6. Seats will be arranged in unified admission system (instead of Govt.health University union of colleges). 7. 3 members will be appointed for the supervision of admissions. 8. "B"category admission process should be completed in the prescribed last date. 9. NTR University will supervise the allotment of seats. 10. According to the rank in admission test admission will be given. 11. Prescribed fee should be paid at the time of counselling only. 12. If the selected candidates did not join the seat can be filled by "C"category. 13. Non Minority fee particulars in non minority colleges.